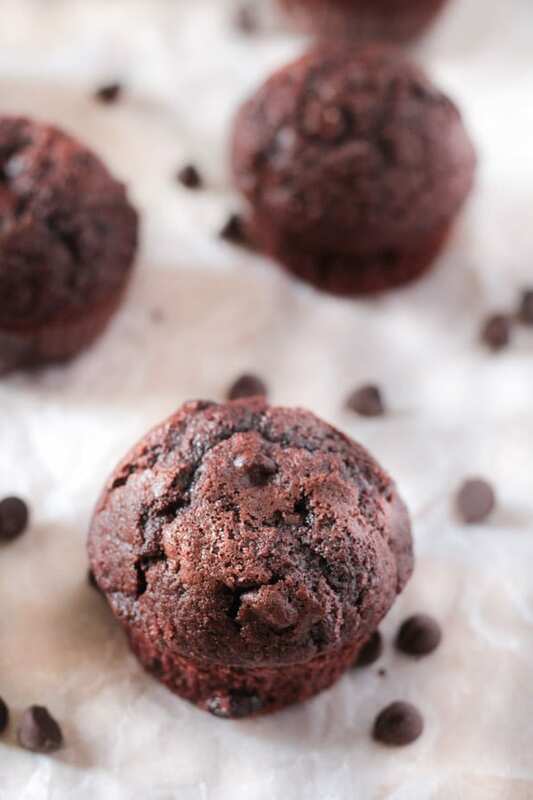 These Double Chocolate Muffins are super delicious, fudgy and chocolatey and the best part is that these easy chocolate muffins are made without a mixer! I love all kinds of muffins, so naturally I have lots of muffins on the blog too! 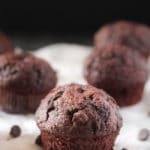 Here are some more delicious muffin recipes to try: Best Banana Muffins Recipe, Healthy Banana Oat Muffins – Blender Recipe, Cream Cheese Filled Chocolate Muffins, and Super Moist Pumpkin Nutella Muffins. Double Chocolate Muffins – No Mixer Needed! 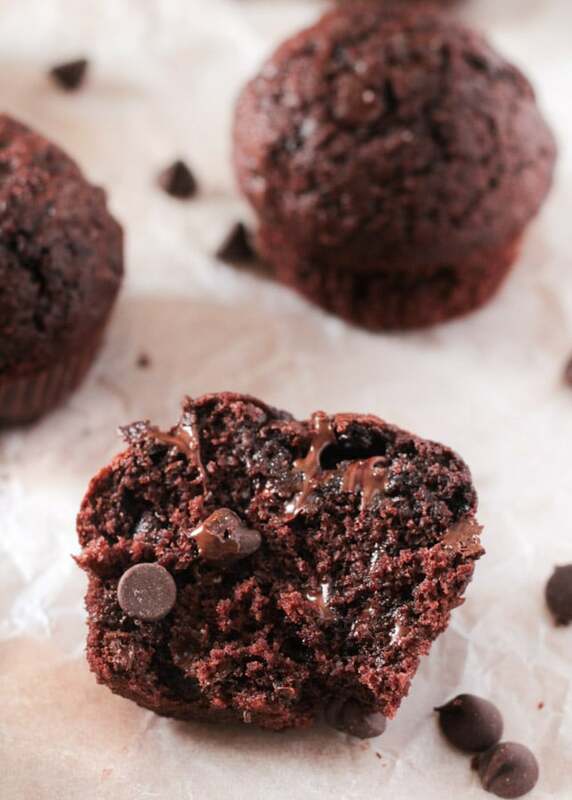 These muffins are perfect for any and whatever kind of chocolate lover you are. The melty pockets of chocolate chips (thanks to 2 whole cups of chocolate chips that go into this heavenly batter)!! The soft and moist crumb. And the nice and chewy crusty top of the muffins. It’s a blissful chocolate experience, I tell you. These muffins are pure chocolate perfection. I like to pair them with a strong cup of cardamom tea, but they would go just as well with coffee. Because coffee and chocolate are best friends forever. Speaking of which, we do add some coffee to the muffin batter, to bring out the chocolate flavor. Don’t worry though if you’re not a coffee lover, because you won’t be able to taste it. You may also opt to skip it, if you want to. So What Ingredients Do You Need to Make Double Chocolate Muffins? All Purpose Flour – the start of any delicious baked good of course! Both baking soda and baking powder as the raising agents. And lots and lots of chocolate chips!! How Do You Make Easy No Mixer Double Chocolate Muffins? This Double Chocolate Muffins recipe is super easy to make, and requires no mixer at all. For the full ingredients and instructions refer to the recipe card below. However, I’ll walk you through the basics of making these Double Chocolate Muffins. Start by melting the butter, and then set it aside to cool. Combine the dry ingredients in a mixing bowl: flour, cocoa powder, baking soda, baking powder, salt and granulated sugar. Whisk until combined. In a separate bowl, whisk together the wet ingredients: eggs, buttermilk, oil, melted butter, coffee, and vanilla extract. 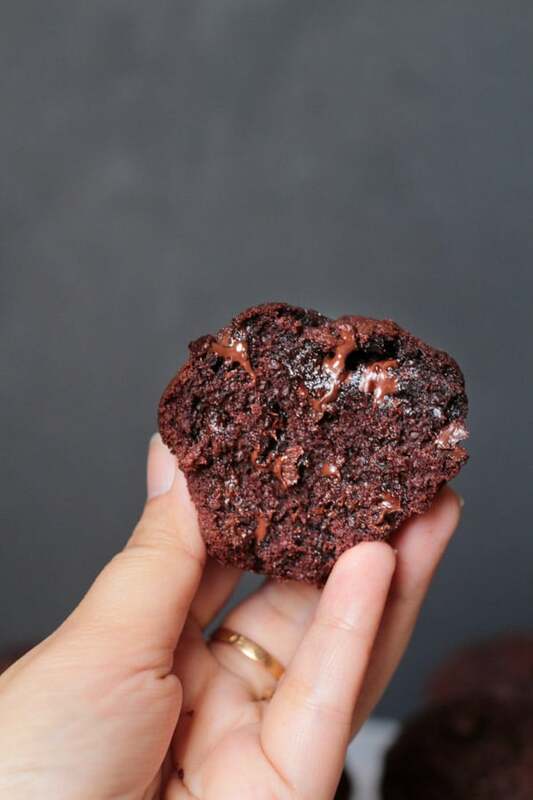 We use both butter and oil in this Double Chocolate Muffins recipe. The butter provides moisture and flavor, and oil helps to achieve the soft moist crumbs in these delicious Easy Double Chocolate Muffins. Pour the wet ingredients mix into the dry ingredients mix, and whisk until just combined. Do not over mix. Gently fold in the chocolate chips and pour the double chocolate muffins batter into a prepared muffin pan. These muffins are your best friends, they don’t ask for anything, all they do is give you chocolatey sweetness and each crumb is there to help you cheer up. And since they’re muffins, it’s totally okay to have them for breakfast because we all know that muffins = breakfast. Yay! Now I gotta go and brew some piping hot cardamom tea, so that I can devour one or two of these beauties! These double chocolate muffins are crazy good, and I mean crazy addictive as well. Soft, moist, full of melty pockets of chocolate, perfect for breakfast! Melt the butter in a bowl, and set aside to cool. In a separate bowl, whisk together the eggs with the buttermilk, oil, melted butter, coffee granules and vanilla extract. Pour this mixture into the dry ingredients and mix until just combined. Do not over mix. The batter will be thick and lumpy. Divide the mixture between the muffin cups and fill them almost all the way to the top. Bake for 3 minutes and then reduce the oven temperature to 180C/350F - the high temperature helps the muffins rise high. Bake for an additional 12-17 minutes (15-20 minutes total), until a toothpick inserted into the center of the muffin comes out clean - NOTE: you will have to be careful as there are so many chocolate chips you may get a melty pocket and it may seem the muffins aren't cooked through - either insert the toothpick avoiding the chocolate chips or use the touch and spring method - if the muffins are cooked they'll spring back when you touch the top. Transfer to a wire rack and let cool for about 15 minutes before removing from pan. You may use DIY buttermilk/soured milk as a substitute. Simply measure out 1 cup of milk and stir in 1 tablespoon white vinegar and let the mixture stand for 5-10 minutes until the milk is curdled. Your DIY buttermilk is ready for use! Recipe very slightly adapted from Pretty Simple Sweet. These turned out great! Not too sweet and perfect for breakfast – very moist and delicious slightly warm and melty! Made this a traybake and otherwise followed recipe to a T.
There were too many chocolate chips so I’ll reduce to 1 1/4 or 1 1/2 cups. I really enjoyed it though. And the no-mixer part was great. Turned it in to a loaf cake as I felt there was way too much batter for a dozen muffins. It was yum! I loved that it was a no mixer required recipe! Increased bake time to 40 mins though.. Thank you for a great recipe. Thank you soooooo much!!!! This is the greatest recipe I’ve EVER tried!!!!! They are sooooo perfect!! !